Republican presidential nominee Donald Trump’s former campaign manager, Corey Lewandowski, reflected on Trump’s canceled Chicago rally during a television appearance Monday. Lewandowski was discussing Trump’s recent outreach to the African-American community with other panelists on Anderson Cooper 360 when he brought up the nixed March rally at the University of Illinois-Chicago Pavillion. The event was ultimately canceled after violent clashes between protesters and Trump supporters erupted outside the venue. "You know what’s amazing to me is no one remembers that Donald Trump went to go have a rally in Chicago at the university," Lewandowski said. "And do you remember what happened? It was so chaotic and it was so out of control that Secret Service and the Chicago Police Department told him you could not get in and out of that facility safely and that rally was cancelled." The Chicago Police Department said in a statement immediately following the chaos that they had not advised Trump’s campaign to cancel the rally. "You showed the footage many times of the individuals who attended that rally," Lewandowski added. "Donald Trump had that rally booked." After being prompted about what the rally in Chicago had to do with the black community, Lewandowski claimed "that is a black community." "He went to the heart of Chicago to go and give a speech to the University of Chicago [sic] in a campus, which is predominantly African-American, to make that argument," he said. "And you know what happened? The campus was overrun, and it was not a safe environment." Fellow panelist Angela Rye went back and forth with Lewandoski, asking if he would "acknowledge that black communities all over the country are still not monolithic." She noted that the same thing "wouldn’t necessarily happen" if Trump tried to visit Cleveland, Dallas or Los Angeles. Lewandowski rebuffed Rye’s claims, insisting that the conversation had shifted from the substance of Trump’s speech to the location. "So whose fault is it that that particular event in Chicago was completely destroyed?" Lewandowski asked. Rye responded, "it’s not all black people’s fault." "I didn’t say it was," Lewandowski said. Panelist Tara Setmayer then jumped into the fray, noting that the event at UIC wasn’t particularly geared towards African-Americans. "It was not to go there to speak to an audience of black folks there," Setmayer said. "It was to go to a predominantly white audience, just like before." Lewandowski objected, noting "that audience was not white." "Yes, it was," Setmayer said. "That event is open to everybody," Lewandowski said. "So there were no African-Americans inside that event? I could see them." Setmayer claimed the event was "not catered to them." "That is a complete excuse for blaming it on the venue what happened in Chicago, that’s number one," Setmayer said. "Number two, the point that was made, that’s a very simple one. If you want to speak to women or if you wanted to speak to a group of single mothers, you’re not going to go and speak to white business executives about an issue that affects single mothers. Tone matters. The venue absolutely does." 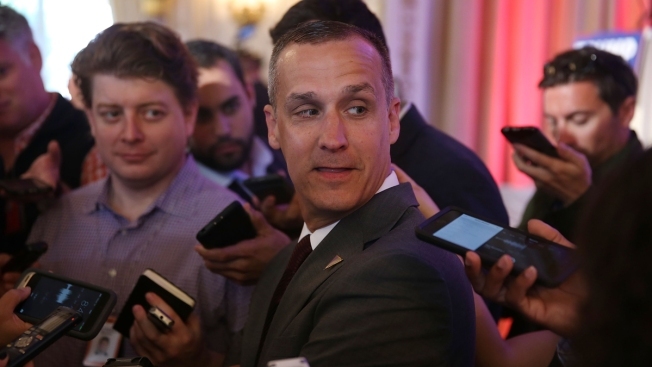 Lewandowski responded, asking if it was "not good enough" that Trump went to Chicago. He claimed the city has the "highest murder rate in the country, the most African-American people." Setmayer responded, noting that Trump didn’t attempt to meet with African-American business owners at the Chicago Urban League. "Explain that to me," Setmayer said. "Explain how that makes sense." Rye then asked Lewandowski how Trump plans to respond to Chicago’s pervasive violence. Lewandowski noted that Trump has met with members of the Chicago Police Department who told him that they simply want to be empowered to do their jobs, which the nominee controversially said in a separate interview. "That means give us the tools to make sure that we can have more people on the street, make sure we have the resources necessary to go and make sure we’re stopping criminals," Lewandowski said. "We know who the criminals are." Lewandowski went on to ask the panel what President Obama and Democratic presidential nominee Hillary Clinton have done to combat violence in Chicago. Rye clamed "people only start caring about black lives when it's for political fodder," noting that Trump has called African-Americans thugs, listing Trayvon Martin, Jordan Davis and Michael Brown as examples. In response, Lewandowski noted that Trump was the first person to allow Jewish people and African-Americans into his Mar-a-Lago club. "Corey, that was to make up for the housing discrimination cases," Rye said. "You guys are not going to hold him out like he’s Martin Luther King."